Click of images below for additional information and prices. Payments now accepted through our online store. "Just one Bite and You'll Be Screamin - WoW Wee!!" WOW WEE Dipping Sauce is a great all-around sauce that can be used to enhance any food; even though, it is most widely used to dip boiled crawfish. The original WOW WEE Dipping Sauce is amazing, to say the least, but Wow Wee has added a second product to the family called Wow Wee Spicy Cajun. The Spicy Cajun sauce has the same great taste as our original, but is made for those of you who like it hotter in the kitchen. 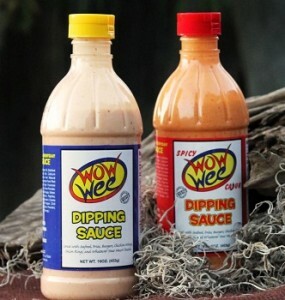 WOW WEE Dipping Sauce can be found in many locally owned stores across Central and Southern Louisiana and Mississippi. So keep your eye out or just ask around the grocery stores near you for Wow Wee Dipping Sauce.